I wrote this song almost 35 years ago and it literally went round the world. Meanwhile there are dozens different titles to it, such as "The Barrel Song", "The Excuse Note", "The Sick Letter" - you name it. The original Cooksey version of it is sung to the traditional Irish tune "In the Garden Where the Praties Grow". This song was written during the campaign by the Burren Action Committee to prevent the building of a large visitors center at Mullaghmore in the Burren in County Clare. Written in 1980 for The Furey's, the original arrangement was by Finbar Furey. This song has also been widely recorded by other artists but The Furey's version is considered to be the best. The song is dedicated to the thousands of lrish building workers who left horne to find work in London in the mid 70's, and the homesickness created by the endless cycle of work and drinking. The small market town of Ennis, with its narrow streets and numerous public houses is a bustle of activity by day and by night. I wrote this song in 1996 about a girl I saw often in Ennis and admired from afar but could never find the words to speak to. 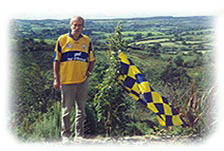 The song was the winner of the Newport song contest, held in Tipperary each September, and has since become a great favourite in Clare. The song features on The Ennis Singers Club cassette CLARE SONGS AND RARE SONGS. I wrote this song in Germany in June 2000, and performed it for the first time at the Bardentreffen in Nuremberg in the same year. It has recently been recorded by The Dubliners, the song may also be found on my own CD "Live in Nuremberg". This song is dedicated to the memory of the late Scottish singer Hamish Imlach who was a friend of mine. The last time I met Hamish we sang and drank together long into the night and he asked me to write a song for him. This is not the song I intended to write, but instead is a tribute to a wonderful man whom it was my pleasure to have known, the song features on my CD "Words".